Appréciation d'ensemble / Overall evaluation : "Fascinating stuff whoever composed it". The authorship of Septem verba a Christo in cruce moriente prolata has been disputed for more than a century. 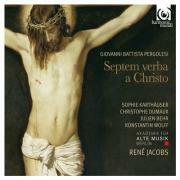 There is no firm evidence that Pergolesi was commissioned to compose this compact oratorio-like cycle of short cantatas contemplating the seven last sayings of Christ during the Crucifixion, so it seems an over-optimistic leap of conjecture to place much trust in the attribution to ‘Sig Pergolese’ found on several monastic manuscript sources made c 1760 and preserved in Zurich and Munich. In 2009 another set of performing parts was rediscovered at Kremsmünster Abbey in Austria by musicologist Reinhard Fehling, whose critical edition is the basis for René Jacobs’s recording. Fehling argues in favour of the work’s authenticity as bona fide Pergolesi and there is no doubting the enthusiasm of Jacobs, who offers some insightful remarks on the score’s musico-dramatic features and shares Fehling’s sensible observation that ‘its value does not depend on whether Pergolesi actually wrote it’. The Akademie fur Alte Musik Berlin provide a peculiar juxtaposition of archaic continuo featuring prominent lute and arpeggiating harp against proto-classical soft horns and elegant strings. Sophie Karthäuser shows extrovert flair in the heroic-style horn aria ‘Quod iubes, Domine’ but the indisputable highlight is the fourth cantata (‘My God, why hast thou forsaken me?’): Konstantin Wolff’s compassionate ‘Huc oculos’ (with muted trumpet) is followed directly by Christophe Dumaux’s limpid finesse in ‘Afflicte, derelicte’ (featuring viola obbligato). Fascinating stuff whoever composed it.